Finally we're back in league action today - it seems to have been ages since we played Fulham, all of 12 days - but it's our top priority for the next couple of games at least until we're back in FA Cup action again. The trip to Wales won't be easy. Swansea have lost just one league game at home and have conceded just four goals. We're going to have to be at our best if we want to bring three points back to north London. The team news isn't great. 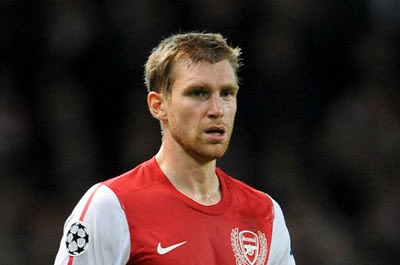 The manager will give late fitness tests to Per Mertesacker and Tomas Rosicky who haven't trained all week due to illness. However he does welcome back Johan Djourou to the squad and you would imagine the Swiss defender will slot straight back in at right back following Francis Coquelin's injury. Bacary Sagna, Carl Jenkinson Kieran Gibbs, Andre Santos and Thomas Vermaelen are all undergoing treatment, whilst Jack Wilshere and Abou Diaby are still missing. As reported last week, Diaby is in Qatar where he has undergone rehabilitation after an ankle problem. And the Sunday Mirror report he will move on to Miami to work with a fitness trainer prior to returning to London where it is hoped he'll be ready for first team football in March. The latest with Vermaelen is that he should be back on schedule to play next weekend against Manchester United, again according to the Sunday Mirror. And the manager has stated again that he's not a fan of the January transfer window. "I am for scrapping the January transfer window. Either you leave it completely open or you close it completely, but now it’s in-between where everybody becomes nervous in November until the end of January. "It not only makes the manager’s job harder but it’s harder for the club as well. "Even for the players, too, because this way it means at the start of the season you can have players saying, ‘If I don’t play, maybe I will leave in January’. So they are already less committed to the cause. It gives them an opening." One other issue the January window causes is that supporters expect managers to go into the transfer window and buy if the team isn't performing well or is suffering a lot of injuries. I don't think the commitment of players is the main issue, although you can imagine if you were a squad player and not getting games you might go and knock on the manager's door and ask him what are your chances for the rest of the season. I don't think the situation before the summer and winter transfer window helped as much either. Surely players who weren't getting games in October would be requesting moves then rather than now, where they could be waiting until the end of November. I don't think there is a perfect solution. What hasn't helped us is that we've been hit this season with two late departures in Fabregas and Nasri. But also the fact we didn't qualify for the Champions League automatically and had to play a qualifier. That meant players we signed in the final three days must have wanted to have been guaranteed football in Europe's elite competition prior to signing for us. The other issue is that the Premier League starts before all the other major European leagues, which leaves us at a disadvantage. And as we know, the manager is keen on a bit of last minute shopping to get a few bargains and that doesn't help with integration into the squad and a full Arsenal pre-season. The manager can't hate the January window that much having previously splashed out on Andrey Arshavin, Theo Walcott, Abou Diaby, Emmaneul Adebayor and Jose Antonio Reyes. And only last week he re-signed Theirry Henry on loan. You would expect Arsenal's record goal scorer to start on the bench this afternoon, with Robin van Persie returning to the squad following his sunshine break in Dubai. "I gave Robin a breather because he is under more pressure than anybody else because of his injury history and because he played more games than anybody else in 2011. "He was always happy when Thierry joined us, but what we expect of him now is to continue his goalscoring record he delivered in 2011 and hopefully ready for another fight." With Henry back at the club, there is room for the manager to substitute van Persie if needed as the Frenchman does provide more of a goal threat than Marouane Chamakh and Ju Young Park. And there is also the other option of playing them alongside one another, something I'm looking forward to seeing. There are a couple of bits of transfer tittle-tattle doing the rounds. The Sunday Mirror report we "could" be interested in Ravel Morrison, the Manchester United teenager whose contract comes to an end in June. First Paul Pogba, now Morrison... doesn't seem like Alex Ferguson is looking after his club's next generation of players. I'm sure if Wenger is interested in either Pogba or Morrison a deal could be done for them. Elsewhere we're one of seven clubs who were at the Carling Cup semi-final first leg between Crystal Palace and Cardiff last Tuesday to watch the Welsh side’s 18-year-old left winger Joe Ralls, also according to the Sunday Mirror. Two other Arsenal related stories doing the rounds. Super Robert Pires could earn himself a million dollars for seven weeks’ work if he decides to see out his professional career in India - full story in the Sunday Mirror. For some extra reading there is Emmanuel Petit's inside story on Thierry Henry's return to the club - also in the Sunday Mirror. This afternoon's game is a 4pm kick off, enjoy it where ever you watch it.